The premiere tachograph software for Android, iPhone and BlackBerry 10, TruckerTimer helps thousands of professional drivers in the UK and EU stay legal and maximise their hours. 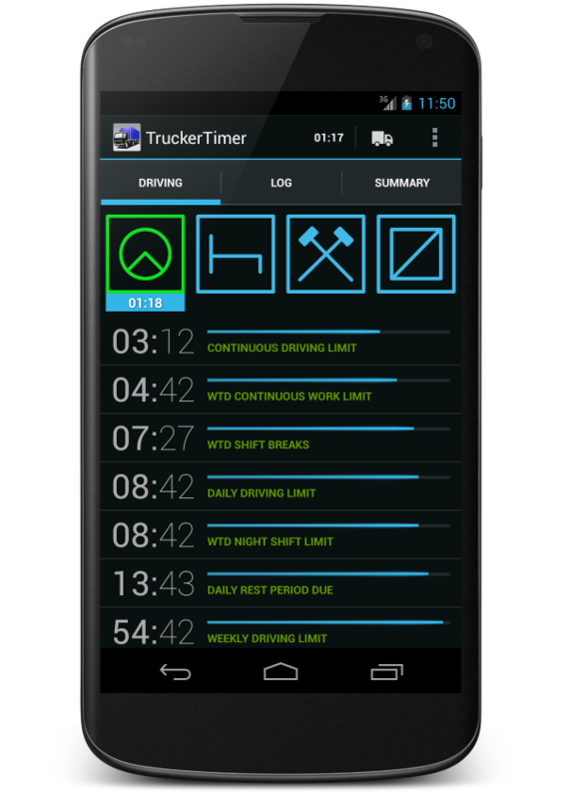 TruckerTimer is the only application designed specifically for truck, lorry and HGV drivers in the UK and Europe that will help you track your driving hours and alert you to impending fatigue violations. TruckerTimer is designed to keep you legal within the many complex rules of the EU driver's hours regulations. "An excellent app for monitoring driver hours... First class!" "Excellent app. The only one of its kind..."
"Brilliant would recommend to anyone." "Fantastic application...if there was a reason to buy a smart phone this would be it"